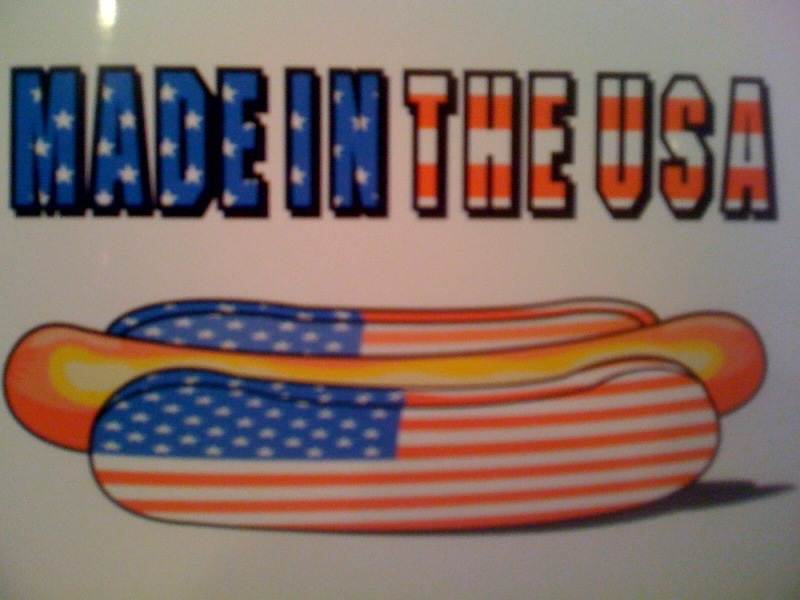 If you have ever noticed My Favorite Hot Dog Links section of this blog, you will certainly have noted The Hot Dog Blog. Well guess who drove right past Yank's Franks today. Yes, it was Mike from The Hot Dog Blog. Anyone who has read Mike's blog knows that if Mike drives by a hot dog joint, the next move is a U turn. That's exactly what Mike did and he arrived at Yank's Franks to give us a try. What did Mike order...The Yank's Frank of course. Had I been more on-the-ball I would have snapped a photo of Mike biting into his Yank's Frank. Oh well, maybe Mike's beautiful sidekick got that shot and we'll see it on his blog. Have You Been to Yank's Franks Yet? 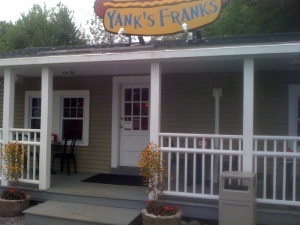 If you have been to Yank's Franks and loved your meal, share your experience with others on TripAdvisor. Follow the link and tell everyone the good news. Thank you, from everyone at Yank's Franks. 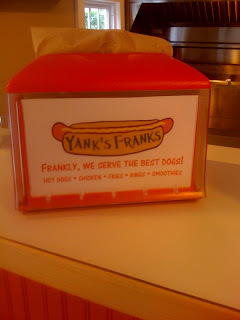 Oh, if you haven't been to Yank's Franks you really should try it. 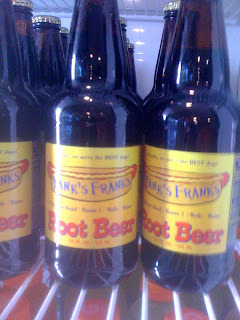 You've chosen your hot dog (or hot dogs), and you have selected a Yank's Franks Root Beer for your beverage. So far you are doing great. What about dessert? You have to get dessert. Again, we have made your choice an easy one. 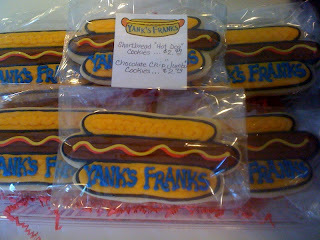 You need to try a Yank's Franks Cookie. Not only are these cookies fun, they are absolutely delicious. They are handmade by Cookies by design in Exeter, New Hampshire. We're not sure how long we will continue to sell them (it depends on how they sell), so stop by and try one. You will come back for more. 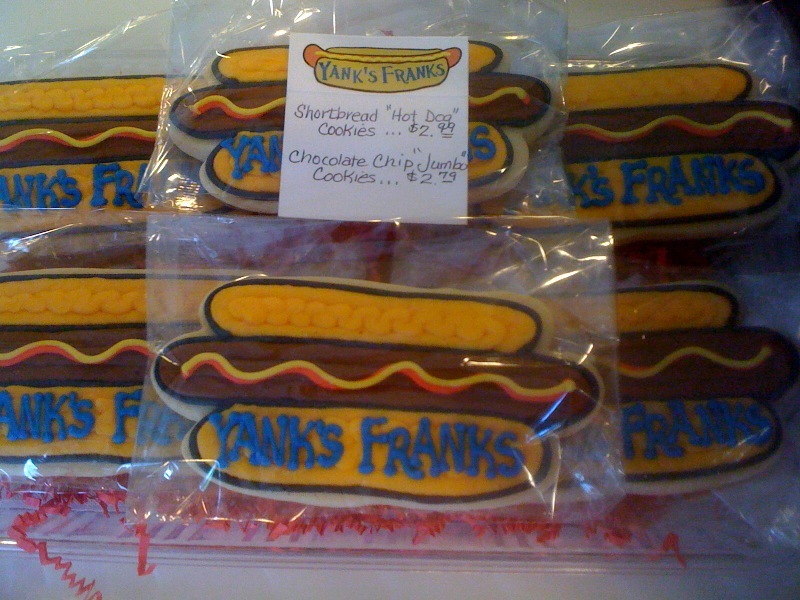 Frankly, we serve the BEST dogs (and Cookies and Root Beer)! Which Hot Dog Should You Get At Yank's Franks? The choice of which hot dog to get at Yank's Franks is difficult. We had one patron yesterday that ate six hot dogs and the young lady he was with had three hot dogs. Apparently they found a way to make the choosing a little less stressful. Once you choose your hot dog and perhaps a side of fries or rings, we have made the beverage choice easy. You should select a Yank's Franks Root Beer. Our own custom root beer is delicious and refreshing and it just arrived late this afternoon.We put it in the beverage cooler after we closed, so it will go on sale tomorrow. Frankly, we serve the Best dogs (and Root Beer)! No matter where you look at Yank's Franks, you'll see the little extras that Hot Diggity has taken care of (hey, I put this parenthetical statement here so my sentence wouldn't end with a preposition. See, I wasn't sleeping in English class, I was resting my eyes). Yank's Franks is Featured at Sassy Condiments! An article about Yank's Franks is featured at Sassy Condiments! ~ Sassy Bits of Life and Food. Sassy Condiments! has written about street foods of all kinds, however they have strayed from their usual M.O. and done a piece on Yank's Franks because as she says she was, "Drawn in by the Yank's Franks blog about an Entrepreneur (and future hotdogger) detailing, from start to finish, the trials and tribulations of establishing a "Hot Dog Joint" I am straying from my usual Street Food." In addition to featuring various Street Food vendors, Sassy Condiments! also has several great recipes for everything from appetizers to desserts. It's one-stop shopping for good food (and now, with the addition of Yank's Franks, great hot dogs). A big thank you to Sassy Condiments! Yank's Franks has been written up as The Hot Dog of the Week by "The Hot Dog Guy" in his blog, Dogs on the Road. Dogs on the Road is a site devoted to the hot dog. Covering the latest in Hot Dog News. Additionally, Dogs on the Road seeks out hot dog spots to guide the weary hot dog lover in his/her attempts to enjoy the All-American treat. The Hot Dog Guy and "Side Dish Jody" travel the countryside enjoying new spots. The Hot Dog Guy enjoying new versions of Dogs and Side Dish Jody enjoying just what her name implies (she's not a hot dog fan). Well Side Dish, when you come to Yank's Franks you can choose from delicious chicken tenders, a veggie dog (not for me) or try our incredible French fries and onion rings. Yank's Franks Opens With A Bang! We are thrilled with the comments we are getting from our customers. From the local Wells residents, to the travelers from "away," the comments about the hot dogs and about our renovations have been so nice to hear. 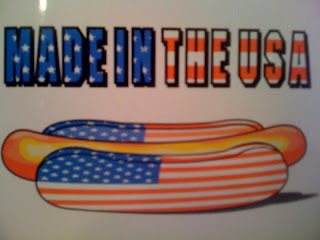 The most popular hot dog...The Yank's Frank. It's a hot dog on a toasted bun with Raye's Downeast yellow mustard, sweet relish, raw onions, a slice of tomato, a slice of dill pickle topped with celery salt. The most popular condiment...mustard, of course. The surprise (for me) runner up condiment...raw onions. We are going through them like crazy. There you go, three days down and we're doing great. Tomorrow, August 9th. Our hours are 11:00 am to 7:00 pm. We hope to see you at Yank's Franks. 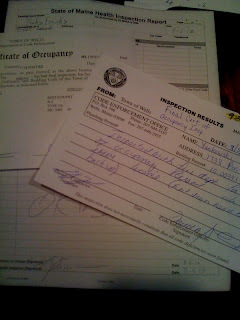 Yesterday was "Inspection Day." We had the Fire Department, The Town Code Enforcement Department and the State Health Department into Yank's Franks to give the final A-OK.
All went well and we are ready for business. 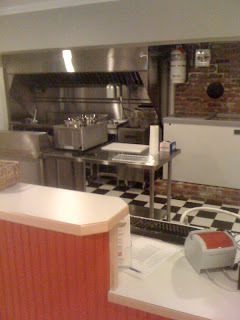 This weekend we take care of the final touches and do a thorough cleaning of the entire place. Our food was delivered today. There were a couple of items that need a slight change, but that will be taken care of early Monday morning. All systems appear to be GO for a Monday opening. 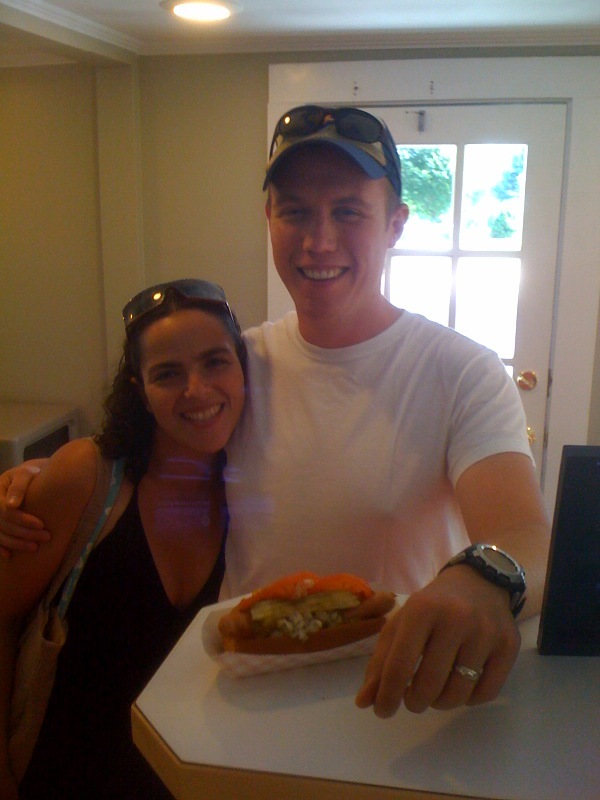 Frankly, we (will, in just 60 hours) serve the BEST dogs!